Below is a cut and paste of a conversation I'm having with Matt from DIYAutotune.com. It started as a question about their MegaSquirt PNP. I'm really interested in doing the ECU for the 2.2 as cheaply as possible but I don't want that to effect the performance potential of my motor. I'd value your thoughts/opinions on what Matt has to say about their system, and if you MS guys could tell me how difficult it is to put a homebrew system together. Jeff, I know you are going MS but have you fired or tuned your motor yet? only exception is that there were a few that were 2wd instead of awd. eMS-Pro on this car too, although it will again not be plug and play. have been looking at a couple of Subaru possibilities. come out with a few items for the sand rail market at some time too. development, not something I can say for sure we would be offering. Thanks for the info on the eMS-Pro, that looks more like something I could use. My 2.2 motor is a 1991 EJ22T out of a Legacy, I want to be able to use the OEM sensors (something the EMS Stinger can do) to "idiot proof" the install and make maintenance simple as well. I believe it is a wasted spark ignition and the crank trigger is a multi-tooth style, not missing tooth as the megasquirt needs, it also has a cam position sensor. Does that sound do-able to you? I have a 1997 2.5 Outback as well, along with a 1999 2.5 motor out of an Outback. I have plans for the other 2.5 motor too. I know a guy who can help me tune/tweak the maps. I just don't want to have to deal with machining, setting up, and orienting a crank trigger. I'd be happy to call you if you think we can get something put together. teeth with one missing). Does this sound like a viable option for you? Unless you already have the specific tools to do circuit board assembly, I'd lean towards a pre-assembled unit. I think the microsquirt would be an excellent choice, but don't think you'll save a huge amount of money over one of the more plug-n-play ECUs. It's not that it's hard to assemble the kits (can be fun actually) - but you'll need a really good soldering iron (figure $65-100), a magnifying headset, VOM, specific solder, and you really need a static dissipative worksurface and wriststrap. Figure a couple hundred on just these "tools". Then add in the kit prices - MSIIV3.0 $250, relay board $65, Stim $45, cables $70, extra wiring $50 - about $500 there. You'll still need a laptop for tuning, plus a wideband O2 sensor and electronics - few hundred more (though you'll need these with any system if you need to tune it). Then you get to read and absorb the build manuals, build it from scratch and test everything out yourself. I'm not knocking the system, just be aware of the total costs ajnd time/effort involved! I put my kit together over a Winter - a fun little project spread out over many weeknights and a weekend or 2. Something to do over the long cold Winter! Now I want one of the black cases. For me, fitting the engine with a 60-1 tooth crank trigger wheel is the way to go, then just run an EDIS ignition. Foolproof and well proven. That'll work on the SVX and all the 4-cylinder engines. I modified the original crank damper wheel to mount the trigger wheel on the backside. This required some machining of the damper and a little on the triggter wheel I used, then I just bolted the two together, followed by having it re-balanced. I'm using the original crank sensor for the electronic trigger, mounted in a simple custom mount above the trigger wheel. I'll even be able to keep the COP ignition with the EDIS set-up, just wire the ignition directly to the COPS (with wasted spark firing). Maybe MS has advanced and now EDIS is "old school"? I think the drawback with the 3-point trigger wheel is you lose resolution for the ECU and monitoring crankshaft position? Plus, that part of the crankshaft is likely hardened and not easy to get to with any kind of cutting tools - unless you have the crank totally out of the engine. 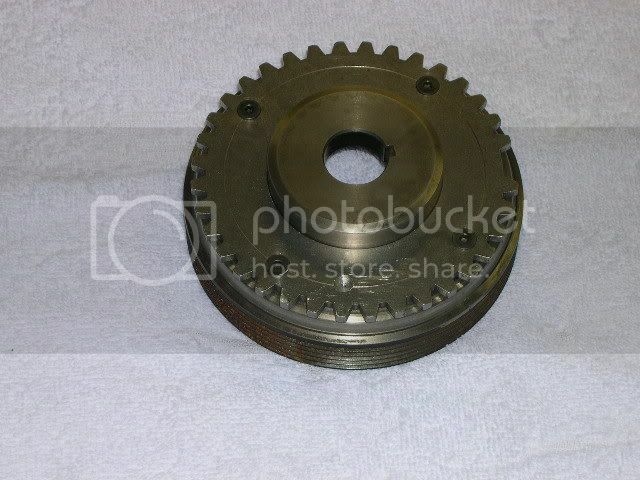 Can't remember though - is the OEM timing wheel part of the timing belt cogged wheel, or integral with the crankshaft. Been so long since I was in there I've forgotten! If it's on the cogged wheel it is removable and maybe easier to modify. Someone a long time ago was going to try and replace the OEM timing wheel with a same size 60-1 wheel. Not sure how feesible that is, but an interesting possibility. Nope, no scratch built ecu for me, but DIY has pre-assembled kits that appear to be user/installer friendly. Using the image posted at the above link again and reading the "delay teeth" definition, is it as simple as setting the delay to 6 if the sensor were mounted at 12:00 o'clock? (edit) - After rereading the delay teeth definition a few times, it does seem that simple unless I just missed the point again, it's like 5:00am and maybe that's my biggest problem. If I'm right, you can mount the trigger wheel in any orientation and dial in the offset in the megatune software, correct? It can definitely be confusing Terry! I'm a little rusty now since it's been well over a year since I built my MSII, set up the engine, etc. Correction - my timing wheel is 36-1 (not 60-1 as mentioned above). That means 1 tooth = 10 degrees. Note: I was getting confused myself (again) as I re-read the old MS information - as I was thinking about the "ahead" positioning in dynamic operational sense - if it was "ahead" then the missing tooth should come "before" the sensor as the wheel turns. Looking over all this again I can see they mean "ahead" in a static or more literal sense - the missing tooth is "ahead" of the sensor as you look at the timing wheel in the stopped position!!! This is CRITICAL! But confusing none the less. There is some software tunability with this positioning - mostly meant for tweaking the "as built" position - a few degrees either way. Ideally you design in some adjustability for your sensor positioning to make it exactly 90 degrees with the engine running. My Subaru mount allows some very minor adjustment, but I primarily plan to tune this part with the software (trigger offset setting). It makes no difference where you mount the sensor - as long as the relationship of sensor to missing tooth is the same as above. I installed the sensor mount to determine the "center" of the sensor position, then fitted the wheel and damper, 9 teeth off, clamped (or marked) the timing wheel in relation to the damper, pulled them back off the engine then drilled and mounted the wheel to the damper in that position. I see from your link above they've now got the MS to decode other timing wheel configurations - more confusion! I guess you could almost mount the two at any relationship - as long as you can determine the correct trigger offset positioning to use. The drawback is, EDIS will run with no crank position sensor input at 10 degrees advanced - in a "limp home mode". If the sensor to missing tooth is at some oddball, non-correct positioning, that limp-home mode isn't going to work. It does seem like working with a 36-1 timing wheel makes setting it up much easier - at least from the missing tooth to VR sensor positioning part. Hi Jeff - Jay and I are looking into the trigger side of the MegaSquirt for his EJ20T. Is there any reason you didn't machine the tooth design directly into the back of the dampener versus machining down the dampener and bolting the wheel onto it? Just curious. I really like the idea of using the back of the dampener as the trigger - keeps it closer to the engine and more protected by the belt in a rear engine vehicle. I wanted the triger wheel "separate" from the damper. This sounds sort of contradictory, but the the inner hub of the damper wheel is connected solidly to the crankshaft - solid steel here. The outer portion, where the belt rides is the "damper" - connected with rubber to the inner section. 2) The outer portion isn't all that concentric with the crankshaft centerline - those pulleys do have some runout. 4) The timing wheel I used had to be modified to fit the Subaru hub - I had to open the ID a little to fit snugly over the hub, then drill mounting holes in the back of the damper inner hub to secure it in place. Once I was satisfied with the overall fit, I had the hub assembly re-balanced. I don't see why you "couldn't" machine the back of the damper as you suggest - you could back cut the outer pulley as I did, then maybe index machine "steps" in the back of the inner hub? You'd need to get creative to fit the sensor though - since it would be reading the back of the hub instead of the OD. This is how the new SDS sensor works - except they install magnets in the hub, in only 6 (or 4?) locations (IIRC). 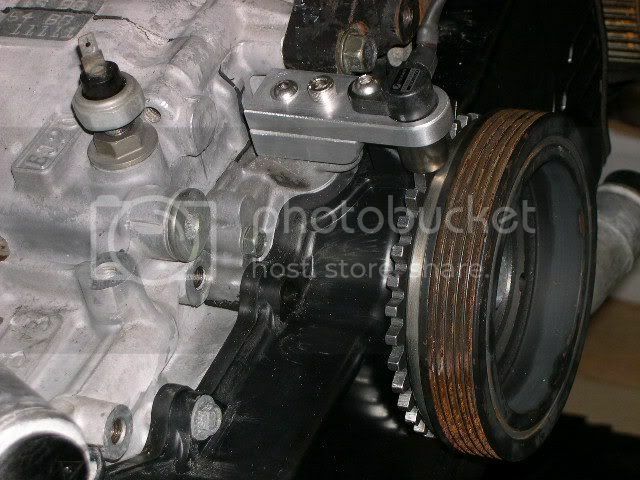 Their sensor is thin, so can be fitted between hub and timing belt cover. You can see the mounting method (bolts onto inner hub portion). "Drilled" spot is the balance mark. Hi Jeff - that makes a lot more sense now - I'll have to take a look at the 2 I have in the garage to see the rubber section - never noticed that before. I think you may have misinterpreted my "machining the back pulley" a bit- I simply meant instead of adding the piece you added, just machining the pulley to look just like what you ended up with. I'm sure it would require a CNC Mill, but it should be doable, right? Then the sensor could go in the same place you put your sensor. I do like your suggestion of hiding the marks on the back side of the pulley but I agree that you'd run out of space for the sensor. I noticed that too in the pic Paul. I don't think it's "exactly" lined up though, I don't have any other pics of the balancer showing this any clearer. The timing wheel was lined up with the sensor location and having the engine at TDC (as I recall) - following the MS directions. I think it is spelled out earlier in the thread. One other note Paul. I did exchange information with a guy from the Megasquirt site (a long time ago) who had done several MS Suby conversions. He even gave me a start-up map to use to get it running. His converison was similar to what you're describing - except I believe he machined the back portion of the pulley down (sort of like I have done), then cut his timing wheel for light press fit over this and secured with a couple of tack welds. Said it worked great, except on one car where the outer pulley slipped on the hub, messing up the timing. So with the right equipment, you should be able to machine "teeth" into the inner pulley and get it to work. He did say, however, he had to be careful when tightening the alternator belt - too tight and it pulled the timing wheel too close to the sensor! I wanted mine secured directly to the crank - via. the inner hub. He agreed this was the better method of attachment. Also, with the EDIS ignition, I should be able to run the Subaru COPS directly off the EDIS ignition module, doing away with the coil and plug wires. Here are a couple trigger wheels that might help. Well when you guys get it all figured out let me know. I've been wanting to do the Megasqurt thing for a long time but gave up and started collecting chicken teeth instead. Please if any of you go this route keep a diary and take some pictures and post it here. Be the first to document a full blown Subaru Megasqurt install. I'd do it myself but I have another project you can all help with on another post. Paul, did you ever get a response back from that outfit in england on the Megasqurt for the Subaru's? I'm not sure if he's still making these, but worth sending an inquiry. With enough interest he might tool up a batch already sized for the Subaru hub? You'd still have to do some machining on the damper, but at least have a timing wheel available. As I mentioned, I had to open up the ID of the wheel a little to fit over the Subaru damper hub, and at that time I also lightly scribed a diameter with the lathe tool on the wheel that matched the mounting bolt pattern I wanted to use. That way it was much easier to locate the mounting holes when it came time to drill them (match drilled through the wheell and damper hub at the same time). The Alpine wheel matches the 36-1 "standard" Megasquirt/EDIS tooth count making it simpler to use - and anything to simplify the Megasquirt installation is a BIG + in my book! I know there may be options to use other timing wheel tooth counts, # missing teeth, etc.? Not up to speed on those options though. Jay and I are moving full steam ahead with the MegaSquirt/Subaru install. 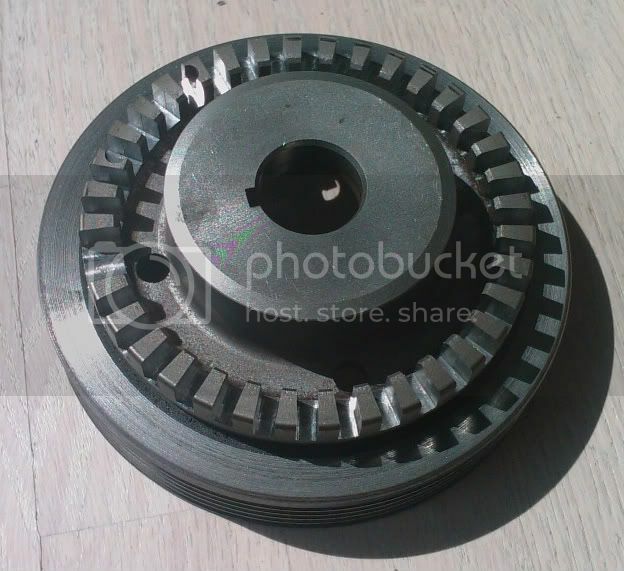 The pulley is at the machine shop to have the rear pulley machined off, the rubber removed and the 36-1 teeth cut into the back section of the hub that would have been under the rear pulley. The next challenge is where to locate the missing tooth on the pulley. Machining the teeth directly into the pulley will give little room for error so I'd really like to do this right the first time. After looking at the 2002 WRX Subaru DOHC engine manual on page 189 for the crank picture, it appears that the woodruff key on the pulley matches up 180 degrees from cylinder #1 being at top dead center (TDC). The diagram and text on the MegaSquirt ignition control manual shows the notch should be 9 teeth or 90 degrees AHEAD of the sensor. NOTE the diagram on the MS page is from "behind" the pulley! With the #1 cylinder at TDC (I removed the #1 spark plug and put a section of rod gently up against the piston and rotated the engine clockwise from the pulley perspective until the piston stopped rising), the key slot in the crank was pointing to the right at 90 degrees - 3 o'clock position - exactly matching the diagram in the manual. The sensor will sit at the noon position above the pulley. Using the diagram from MSII (note, the diagram is from the perspective of being "behind" the pulley - the view the crank shaft would have if it had eyes), puts the missing notch exactly over the key in the crank shaft and pulley. I'm going to attach a poor 3-D drawing of the notch in the pulley with the "missing notch" as the only part removed on the hub, (I'm not sure how to generate 36 cubes around the hub and then subtract them all from the hub in the program "Art of Illusion"...) - but I think it gives an idea of what it will look like in the end. Picture 35 more teeth cut into the hub with one "tooth" already cut being the missing one in the 36-1 (36 minus 1) design and that one missing tooth lines up with the notch. Can anyone verify that I have the positioning right? Also the MegaSquirt has shipped with everything we will need to try out the stock Subaru 36-2-2-2 wheel as well as this design for triggering ignition. The MS will also control boost. Paul, I had a good read through this info, and it looks good. I wish I had a EJ20 just to verify the location of the key way on the crank, but based on what is in the manual, the MS site, and your own verification of TDC and the key way... I would say this is correct. Machine work is done and this is what it looks like! Its off to balancing next. The funny extra holes I think were from the original balancing done by the factory. I can't think of any other reason they would be there. I think the holes are for the holding tool for loosening and tightening the attachment bolt. That's what I used them for! Oh wait - now I guess you're talking about the partially machined away holes in the teeth (after taking a 2nd look)? Yea, probably balancing spots. Paul, I hope you guys get this to work with the MS as I'm getting ready to do 2 engines. 1 4 banger and a H6. This would sure make my life easier. Hey Albert, I'm with you on that one. I can't wait to hear some sound clips of it running. Still trying to "squirt" here. Jay's motor has oil in it now and an empty transaxle hooked up with a starter. I cranked it over for the first time a few minutes ago with just the sensors hooked up to the MegaSquirt. We've got a v3.57 (SMT) MS with an MS2 motherboard installed and am running MS2-Extra code with the trigger signal set up as a 36-2-2-2 input (stock Subaru - the 36-1 crank pulley is the back up plan). I've run it with a JimStim set to 36-2-2-2 with jumper 4&5 turned on. It sees the RPMs increase as I turn the pots. The manifold air temp, coolant temp, throttle position sensor and built in manifold air pressure sensor all show correct readings on the MegaTune software. So from the crank sensor, the shield on the wire goes to the shield on the DIY cable (pin 2). I hooked one of the crank sensor wires to the white wire inside the shielded wire (pin 24). I hooked the other wire the the shielded ground. Cranking produced no RPM. I tried swapping the two wires and still see no RPMS. Next I grounded the shielding (crank and MS shielding) and one of the 2 wires to the engine. Other wire to the white wire, cranked, and I see no RPMs. I flipped the 2 wires and still no RPMs. I assume the crank sensor is a VR sensor (not a Hall) based on the description of a VR sensor in the MS manual and that DIY set it up for a VR, but can anyone else verify this? I looked at how my LinkPlus is hooked to the crank sensor and one wire goes to the crank trigger wire, the shield goes right into the plug on the crank trigger. EDIT: Got approval for the MSx-Extra forum. Here's a link to my post. I may not have seen that specific post, but I did read about needing the correct edge (positive or negative) to trigger it. That is why I tried switching the wires around. There are some other interesting points in the post. I'll have to check the board for pots, but it should be set up for VR already and it does see RPM with the JimStim set for the 36-2-2-2 wheel set up. I don't like the idea of having to make the trigger wheel. What do you do about a crank sensor if it goes bad. Do you have to order one from a megasquirt dealer? I would much rather use a system that uses all stock sensors like the EMS system. Hi Jeremy - Its great to have someone from OutFront join us on SubBug! I did quickly try the MegaSquirt-II with the Extra code using the stock trigger wheel and VR sensor, but it would not register any RPM so I switched to the 36-1 back up wheel machined in the back of the pulley. I reused the stock Subaru VR sensor. I didn't have time to machine up a nice bracket like Jeff made, so I drilled 2 holes in a small plate, spaced it with washers and bolted it on. Jay later decreased the distance between the sensor and the trigger wheel so the RPM would stay stable. So the sensors were all stock. The trigger wheel is a one time deal and wasn't that bad. Of course, if your at OutFront, you should be able to get a good deal on a Stinger.